How to add a service to Kafka. 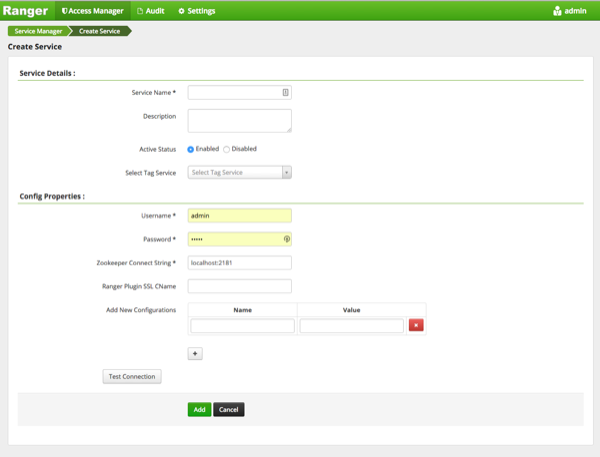 On the Service Manager page, click the Add icon ( ) next to Kafka. Select Tag Service Select a tag-based service to apply the service and its tag-based policies to Kafka. Defaults to localhost:2181 (Provide FQDN of zookeeper host : 2181). Provide common.name.for.certificate which is registered with Ranger (in Wire Encryption environment).